Until recently, Phyllis Sisinni, a member of St. John in Hugo and resident of St. Therese of Woodbury, had a very real fear of falling. It wasn’t unreasonable: She had already fallen several times. It is also why Sisinni’s doctor prescribed a balance evaluation the Catholic senior care facility began offering in March. Just a few weeks into the therapy plan developed specifically for her, Sisinni was encouraged by her improvement. In that amount of time, she went from feeling unsteady on her feet to thinking she may one day no longer need her cane. In 2011, physical therapy teams at St. Therese’s five metro-area senior communities became aware of just how widespread the fear of falling is when their residents expressed this anxiety to a St. Therese Foundation focus group. Seeing a real need, St. Therese of Woodbury made plans for a new therapy program and raised more than $90,000 to fund it. Funds came largely from employees, residents, families and vendors, said Chris Hinnenkamp, St. Therese’s vice president of fund development. The donations helped St. Therese purchase balance-evaluation equipment and test programming from NeuroCom, a subsidiary of California-based Natus Medical Incorporated. Two of St. Therese’s other locations in New Hope and Brooklyn Park have been using the technology since 2009, but the equipment is unique in the Woodbury area, said Katie Saleum, St. Therese’s communications director. St. Therese hopes to eventually provide the equipment at all of its locations, which also include communities in Shoreview and Robbinsdale. NeuroCom’s technology germinated in the 1960s when astronauts returning from extended stays in space were having trouble readjusting to Earth’s gravity. Coordinated research by NASA and MIT scientists resulted in the development of noninvasive clinical techniques for evaluating balance-function deficiencies, which in turn led to the founding of NeuroCom International. Scientists at NASA and MIT determined the ability to maintain balance relies on the following: The body’s sensory systems must supply the brain with accurate body-position data relative to the surrounding environment; the brain must correctly process the data; and muscles and joints must work together to maintain balance. 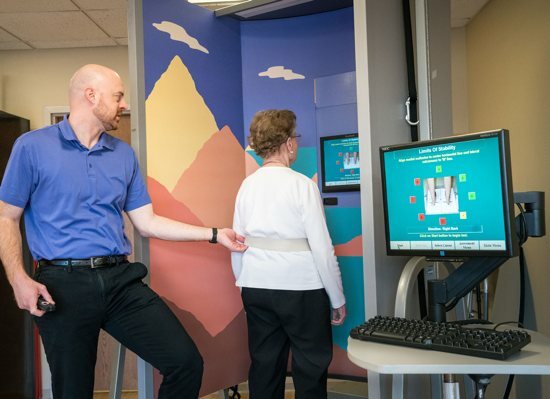 With that knowledge in hand, engineers at NeuroCom developed Smart Equitest and Balance Master, evaluation and rehab systems clinicians use to identify balance issues and correct them. Both therapists and residents at St. Therese of Woodbury consider the NeuroCom evaluation and corrective therapy programs to be huge successes. “In many cases, during an assessment, the therapist knows what the problem is before asking the person being tested,” Taylor-Greengard said. Currently, clinicians evaluate four to five clients daily for balance issues. Taylor-Greengard said St. Therese’s communities are expected to average 1,500 balance assessments and personalized therapy plans per year.